An Iranian-American friend — who learned the technique from his dad — taught me how to make this perennial Persian favorite. Grill the kebabs on a hot summer evening, then wrap them with the herbs in warm lavash bread. A dollop of tangy yogurt sauce brings it all together. Sprinkling the spices on top at the end is optional. Put the saffron in a heatproof bowl and break up the threads with your fingers (or use a mortar and pestle and mix in a bit of salt or sugar to help crush the saffron). Pour the hot water over it and stir to let the saffron bloom. Chop the onions and place them in a food processor. Pulverize until practically liquid. Add the saffron mixture, salt, and pepper, and pulverize until the onion is a even deep yellow. Place the ground meat and the meat chunks in two separate bowls. Divide the saffron-onion mixture in half; mix one half into the ground meat and pour the other over the chunks. Cover and marinate for a few hours, or overnight if possible. Peel and seed the cucumber, then chop it into small dice. (If using Persian cucumbers, just peel and dice them.) Mix the cucumber with the yogurt and then stir in the mint, salt, pepper, and onion. Refrigerate until needed. Wash and slice the radishes into circles or long strips. Wash and dry the herbs, then remove the leaves from the stems. Discard the stems. Thread the lamb or beef chunks onto the metal skewers, shish-kebab style. Mix the baking soda into the ground meat (the baking soda helps the meat clump together). Gently press small handfuls of the ground meat around the skewers until the meat on each skewer clings together in a sausage-like shape. Oil the grill grate and grill the kebabs over medium-high heat, turning once. Cook the shish kebabs rare, but cook the ground-meat kebabs until their internal temperature is 130 degrees. Warm the bread in the oven or over the grill. Serve the hot kebabs with the bread, spices, yogurt sauce, feta, radishes, and herbs; let guests assemble their own kebab sandwiches. 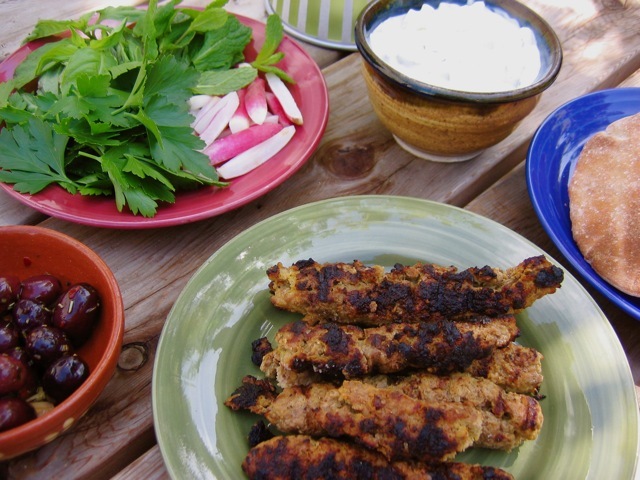 Don't buy very lean ground meat for the koobideh; if you do, the kebabs will be dry and crumbly. Try to get at least 20 percent fat in the meat. Za'atar is a traditional Middle Eastern spice blend of ground sumac berries, sesame seeds, salt, and dried thyme. You can buy it premixed or make your own. Lavash bread and Persian cucumbers are available at Middle Eastern groceries and at Trader Joe's. You can also serve the kebabs with basmati rice instead of bread.